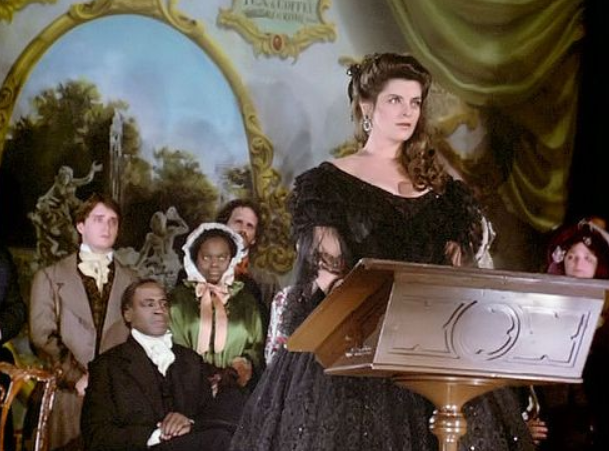 The ABC Novel for Television miniseries North and South, an adaptation based on John Jakes novel of the same name featured its share of strong women with qualities and attributes that could classify them as feminists. Ashton (Terri Garber), Brett (Genie Francis), Constance (Wendy Kilbourne Read), Madeline (Lesley-Anne Down) and Virgilia (Kirstie Alley) all displayed moments of these throughout the film. They were vocal in their views and weren’t afraid to speak out when they felt strongly about something. In Book One, when Madeline Fabray LaMotte overheard her husband Justin (David Carradine) discussing secession at a Main family party, she contradicted what he said and offered her own view “We need the North, we have no factories no resources of our own. We can’t survive on speeches”. This outspokenness shocked the other women at the gathering as all eyes focused on Mrs. LaMotte, who faced her husband’s wrath for embarrassing him in public. “My dear you forget yourself. Nobody here cares what you think!” Justin grabbed her by the arm and dragged her outside and told her “You’re not entitled to any views except those that are mine and mine alone.” Then he issued a threat “If you ever speak out and embarrass me on any subject whatsoever you will suffer as you have never suffered before!” Women of that time were expected to agree with their husbands, stay quiet and maintain the home…feminine was more important than feminism. Later in the miniseries, we saw Constance Flynn Hazard discuss with husband George (James Read) her plan to have the Hazard family home serve as a stop on the Underground Railroad. But this time, a woman with the idea to help make life better for others had the support of her husband. Ashton Main Huntoon and Virgilia Hazard Grady represented women who defied the convention of the time. But whereas Ashton used her beauty and feminine wiles to achieve her goals, Virgilia vocally expressed her views loudly and passionately to anyone who would listen. She constantly criticized the South and its southern way of life for perpetuating the institute of slavery. Virgilia didn’t care what people thought of her or any shame she brought upon her family for her abolitionist behavior. She demanded change and would risk anything to achieve it. Although her actions were considered extreme, Virgilia was a different type of feminist. She sought for the equal rights of both black women and men and refused to remain silent. On the other hand, any feminist behavior displayed by Ashton was to serve only one woman: Ashton herself. 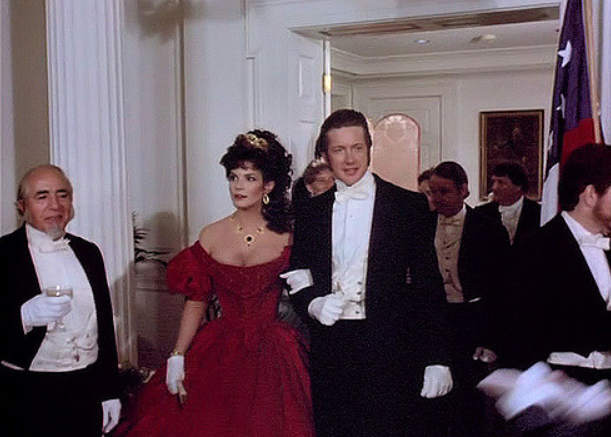 She once told sister Brett what she found attractive in suitor James Huntoon (Jim Metzler) “He has a brilliant future in politics and politics my dear sister is where the power is.” Ashton aligns herself with James and marries him with the hope that he’d rise to a higher position in the Confederate government. Ashton envisioned herself as the future First Lady of the Confederacy. After all, she was smarter and more beautiful than Jefferson Davis’ wife. But unfortunately, James was considered more buffoon than beneficial to Davis. So, Ashton moves onto Elkahah Bent (Philip Casnoff). Bent was a man who shared Ashton’s vision. He wanted money and power and didn’t care what he did to get them. In the 19th century, women were considered second class citizens. Ashton and Virgilia refused to fit into this category. Today’s climate offers many opportunities for feminism. I wonder how Ashton and Virgilia would fit in if they were real people and a part of the 21 century. Would Virgilia speak out on the issues and injustices we see on the news? Would Ashton seek out strong political men? Would they be feminists?